Boyka Fashion eCommerce Shopify Theme + RTL + Dropshipping is a modern responsive premium Shopify theme. Its design is very simple and clean that is why you must be impressed at a glance. It has plenty of options to display your products as your own wish. This responsive Shopify theme is perfect for fashion brand clothes, bags, shoes, glasses, accessories etc. In addition, Boyka has a group of elegant features which are unique and smooth. This customize theme offers 6 Home Versions along with RTL version, Theme Color Options, 25+ Sections, 15+ Pre Loader, Services, Testimonial, Banner, Latest Blog, Contact From, Contact Map and plenty more. Finally, Boyka gives you freedom of choice. 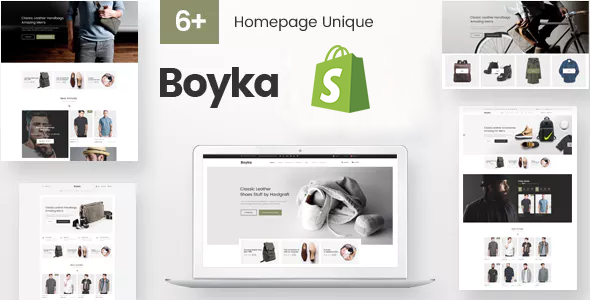 You can enjoy Boyka Fashion eCommerce Shopify Theme without any hesitation.